Hacienda De Mesilla is located in Historic Old Mesilla adjacent the City of Las Cruces. The surrounding area is rich in history and culture surrounded by State and National Monuments protecting the breath-taking views and landscapes. It’s all within your reach… hiking the Organ Mountains, biking along the Rio Grande River or dining in a familiar old Stage coach stop. There are historic day trips in every direction. Venture east just 50 miles and experience the one of a kind White Sands National Monument, an international destination. Or go a few miles east to experience the Prehistoric Trackways National Monument … then north along the Rio Grande, less than 25 miles until you reach the ruins of an authentic 1800s Union Fort located in Fort Selden State Park. Head south to the War Eagles Aviation Museum, one of the largest privately owned World War II aviation museums in the U.S, located at the Santa Teresa Airport. If you want stay closer to your home at the Hacienda De Mesilla, then walk out your hotel door into the historic district of the Town of Old Mesilla and visit the many shops, galleries, and restaurants, many surrounding around the historic plaza. There’s even a weekend market on the plaza. And no visit to Old Mesilla is complete without visiting the Basilica of San Abino, Church founded in 1852. The staff at Hacienda de Mesilla would be happy to help you plan your day trip. The history of what is now Mesilla, NM, dates back to at least the 16th century. The land was first inhabited by Native American tribes, including the Mansos and Pueblos, which were located north and west of the current town. In 1540-1541, Spanish Conquistadores, more specifically Francisco Vázquez de Coronado, crossed the Rio Grande into Northern Mexico, followed in 1598 by Don Juan de Oñate to colonize Nuevo Mexico. The route between Mexico City and the capital of New Mexico, Santa Fe, became known as the El Camino Real. The first permanent settlers of Mesilla appeared after the Treaty of Guadalupe Hidalgo in 1848 following the war between the United States and Mexico. By 1850, the Mexican colony was firmly established with a population of 600. In 1853, with the Gadsden Treaty, Mesilla became a part of the United States and on November 16, 1854, the flag of the United States was raised in the Mesilla Plaza for the first time. The settlement grew rapidly, and became a popular stop on the Butterfield Overland Stage Line by 1858. By 1860, it had over 2,000 residents, making it the largest town between San Antonio, Texas, and San Diego, California. As the town continued to grow, it saw a number of characters from the Old West frequent her streets. Billy the Kid was jailed at the courthouse just across the street from what is now La Posta De La Mesilla Restaurant and Cantina. He was defended by Colonel Albert J. Fountain, one of the more historical figures of his time, who had his practice just up the block in what previously was a stagecoach stop. President Ulysses S. Grant even stopped at La Posta overnight while riding the stage coach, as did Kit Carson, the famous tracker. According to history, Mesilla Plaza was a lively place, with people coming from miles around to attend rooster fights, play cards at local saloons, and enjoy food and spirits at the Corn Exchange Hotel, now known as La Posta. 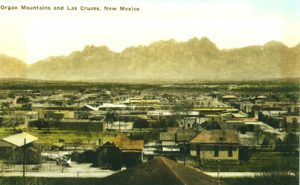 The town finally lost prominence to nearby Las Cruces when it refused to sell right-of-way land to the Santa Fe Railroad. Without the stop for the new mechanism of commerce and transportation—the train—Mesilla would eventually turn into a sleepy, agrarian village populated mostly with farmers. The results, however, is a well-preserved piece of southwestern history. Mesilla Plaza is surrounded by historic buildings, all listed on the National Register of Historic Properties. From San Albino Basilica to the local restaurants and saloons, each has a story to tell.